As with a human athlete, the success of a fitness and conditioning program for your horse is based on the horse’s body’s adaptive response to the stress of exercise. To achieve a conditioning and training effect, the horse must be subjected to gradual increases in workload with each new level of training being maintained until the body adapts to the additional stress. The advantage of a heart rate monitor is that it giv es a continuous reading of the horse’s heart rate before, during and after exercise. After the horse’s body adapts to each new level of training, the workload is incrementally increased, again with a period of adaptation which is then followed by more intense training. These alternate periods of increasing the workload and then allowing a period of adaptation is known as progressive loading. As the levels of exercise increase, the horse is gradually stressed to the point that it is able to tolerate the same exercise the next time with less stress. Both aerobic (occurring in the presence of oxygen) conditioning and anaerobic (occurring in the absence of oxygen) conditioning are involved in progressive loading. For aerobic conditioning, progressive loading is accomplished through gradual increases in the duration and speed of the exercise on a weekly basis. For anaerobic conditioning, progressive loading is accomplished by a weekly increase in the exercise speed or in the number of repetitions of high intensity activity. 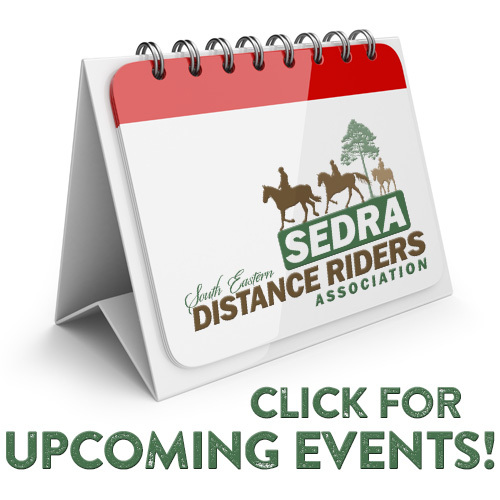 Event specificity – How do you use your horse? Training the horse to use the specific muscles and systems involved in the sport in which the horse competes, while considering the individual horse’s fitness level, are two additional principles of conditioning to consider as you work with your horse. Just as a long distance runner’s training will differ from the training of a pole vaulter, so will the training of your horse focus on the specific demands of a particular type of event for which the horse is training. The specific muscles and systems involved in the discipline will be the focus of training. The physiological and psychological demands of competitive events such as a 3-day event, barrel racing, polo, reining, and endurance racing differ greatly. Training of your horse should be specific to the athletic event in which it will be participating, although this principle need not be followed too rigidly. For example, if your horse is to be involved in sprinting sports, most of its training will focus on being able to accelerate quickly, then decelerate and possibly do intricate maneuvers. You may find that a good alternative exercise is working the horse over hilly terrain which has the advantage of increasing heart rate without increasing speed. This exercise does not put the excessive stress on bones, tendons and ligaments that sprinting does, but does effectively promote cardiovascular conditioning which will pay off in the actual sport. Awareness of the individual differences in horses and the fact that their individual responses to conditioning will differ is another important principle of conditioning. Although genetic factors play a major role in the variation in training response, the state of fitness at the beginning of a training program is extremely important. Age and prior activity level are important since some older horses have a reduced capacity to exercise, while younger horses are often capable of greater adaptations in response to training. A horse that has been inactive for 12 months or more is not going to reach a certain level of fitness as quickly as a horse that has had a six or eight week layoff after a season of training and competition. To push an older horse or a horse that has been inactive for a long time into a full-scale training program without allowing for individual differences is to invite not only injury, but also mental and emotional resistance to the program. The initial stage of conditioning begins with a period of low intensity exercise known as long slow distance training. The horse walks, trots and canters either in the arena or on the trail. The objective of training is to prepare the horse to cope with 45 to 60 minutes of easy exercise. This conditioning improves cardiovascular and muscular efficiency and enhances the horse’s ability to regulate body temperature while stimulating adaptive changes in the limbs. 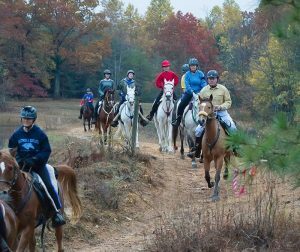 LSD training builds aerobic endurance and allows the horse to exercise for prolonged periods at a low to moderate intensity. This phase of training may take from 2 to 12 months depending on the breed, age, previous conditioning history and the competitive objectives. For a young horse being conditioned for the first time, the process will take longer because of the need for intervening rest days to allow a full adaptation to take place. For a horse that was in good condition previously, but has not been ridden for a few months, the process will be much shorter. The appropriate frequency of exercise training will depend the objectives of the training. When the objective is cardiovascular fitness, workouts performed 3 times a week on alternate days will allow time for tissue repair between workouts. One important fact that you should be aware of is that too frequent bouts of exercise are not likely to produce a faster conditioning response, and, may, in fact, predispose the horse to injury. When the horse is actively competing, the competition may serve as the workout. Remember that too little stress on tissues will not produce beneficial results, but too much stress or insufficient recovery time between exercise bouts will lead to a state of overtraining. Mild to severe muscle strains may occur and the supporting structures of limbs, bone, cartilage, ligaments and tendons that adapt more slowly to the stimulus of exercise may be compromised with strains or fractures occurring as a result of the overtraining. To read more on this article, click here!